I had a wonderful time second shooting this fairytale wedding in August at the Ritz Carlton Half moon bay. I had the honor to shoot alongside Cameron from ChCinema on this beautiful summer day. The beautiful bride L and her closest friends were getting ready in the bridal room. 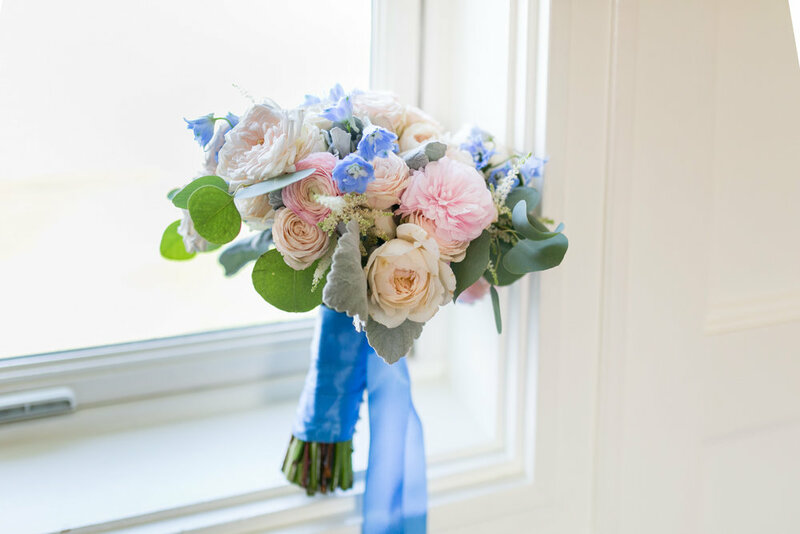 The bridal bouquet was blush and pink with a pop of blue, matched her Dolch Gabanna shoes and off the shoulder wedding dress perfectly. L's mother was also in a blue dress, they had a quiet mother and daughter moment before the ceremony. I always love to give the bride some alone time with her mother on the wedding day, asking the bride's mother to give her daughter marriage advices. Sometimes it brings tears, sometimes laughter, it is the moment they will remember and cherish long after the wedding day. K and L decided to not see each other until right before the ceremony. Their first look was on the property of the Ritz Carlton Half moon bay, the ocean was calm, the sky blue with slightly clouds to give us the perfect lighting to photograph this gorgeous couple. The stunning arch at the ceremony site was decorated with greenery, ivory flowers, and blush draping. The chandelier was a must to complete the elegance of the arch. The aisle was sprinkled with flower petal, ready to welcome the bride and groom. The ceremony was touching and emotional, personal vows and happy tears were shared among K and L's close family and friends. The reception started with the bride and groom's choreographed first dance, following with delicious dinner, speeches and dances. This is one of my favorite part of the wedding because precious memories of the bride and groom are shared with friends and family, many times I get teary eyed alongside the guests. K and L's wedding reception was a luncheon, which gave us plenty of time for golden hour photos. We headed to the beach in a golf cart and our shutter went nonstop! Enjoy these photos!